Fr Hunwicke's Mutual Enrichment: A Paradigm Shift; and Humanae vitae; and the 'ordination' of women. A Paradigm Shift; and Humanae vitae; and the 'ordination' of women. A splendid talk the other day, from Fr John Hemer, at the Confraternity of Catholic Clergy. His talk set me thinking about the real paradigm shift in Catholic studies during the Ratzinger Years. After the terrible aridity of "Modern Biblical Scholarship", as Catholic "scholars" aped what went for "Biblical Studies" among liberal Protestant Northern Europeans and North Americans, Professor Ratzinger (following the teaching of S John Paul II that Scripture should not be seen as a field for disdainful "see how clever I am" analysis) not only restored the respectful study of Scripture but showed, in his own three-volume Jesus of Nazareth, how it should be done. And Benedict XVI put the Fathers into the heart of his homilies and Angelus addresses. And readers will not need to be reminded of the significance of his liturgical interventions. His revelation that the old rites had never been lawfully and canonically abrogated created a New Ballpark (am I getting this idiom right? ), and, more importantly, his assertion, theological rather than canonical, that what has been sacred never can be abolished, puts in place an important marker should some future pope attempt ultra vires to limit Tradition. Fr Hemer's exegesis of Scripture is part of this most welcome revolution. The foundation, in Anglophone countries, of the Confraternities of Catholic Clergy is a highly important factor in the renewal of witness to Catholic Truth. 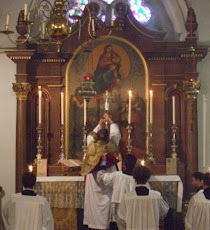 And the erection of the Ordinariates, thus strengthening within the Catholic Church B John Henry Newman's appropriation of Anglicanism, is another monument to the Benedict Paradigm Shift. A particular and most recent fruit of this shift is apparent in the signing by some 500 English priests of a letter affirming the truths taught in Humanae vitae (see yesterday's Catholic Herald). Many of the signatories were, of course, members of the Ordinariate (including married clergy) and of the Confraternity, although the letter was not organised by either of those bodies. At a time when there is unease about the risk that the current Roman regime may try to relativise and water down Catholic teaching, this wise, robust, and sensible document can do nothing but good. In the context of restoring the proper study of Scripture in the Catholic Church the role of the St Paul Center founded by Scott Hahn must be noted. Letter & Spirit, Vol. 6: For the Sake of Our Salvation: The Truth and Humility of God’s Word is well worth reading for anybody who wants to understand many of the weaknesses of ‘modern Scriptural scholarship’. A small point: some of the nearly 500 priests are Scottish, not English. Good comments, Father. It behooves us to watch carefully the maneuvers of the enemy and to counter, even anticipate, with clarity and force. As for "created a New Ballpark (am I getting this idiom right? )," I would say from this side of the pond, "It's a whole new ball game." We don't talk about new ball parks because they are expensive and take years of planning and probably litigation, but you can get a new ball game in five or ten minutes and three or four plays. That's baseball, of course. As Yogi Berra said, "It ain't over till the fat lady sings." Modern biblical "scholars" are idiots - their ideas are based on philosophical and scientific errors and are thus nothing but ridiculous false assumptions. To see both of these forms of nonsense blown to smithereens, go to the Wolfgang Smith Facebook Circle and the Catholic Cosmology and Geocentrism fb page. The very cause of modern theological and scientific error, namely, modern philosophy, is there put to the sword in its Cartesian cradle. Yes, a whole new ballgame (one word). And in the service of scriptural accuracy, Yogi's actual quote, from when he managed the 1973 New York Mets, is "it ain't over till it's over." Listening to all the talk about "vibrant" churches and successful evangelization to the young, another of his quotes might sadly apply to most US churches: "if people don't want to come out to the ballpark, nobody's going to stop them." Would that so many priests were to affirm Humanae Vitae elsewhere in the West. Yes, "ballgame" (one word) is the right idiom. But Father was in the ballpark (close to correct). Yogi's actual quote dates to the season comeback of the 1973 NY Mets. One of his other quotes, sadly, might apply to many parishes in the US today: "If the people don't want to come out to the ballpark, nobody is going to stop them."